This is my first Impetus element for our upcoming club campaign game for the german feudal medieval era. 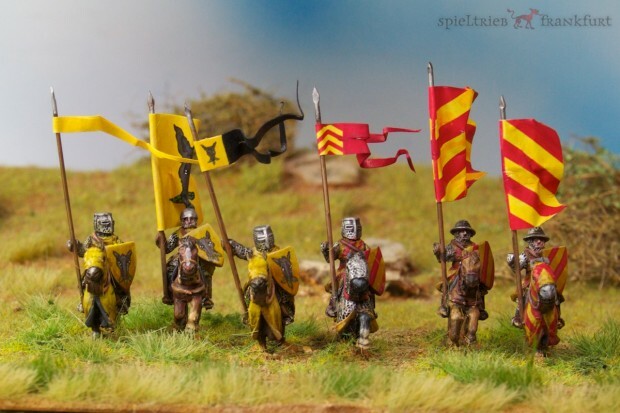 I have chosen the outstanding Legio Heroica miniatures. 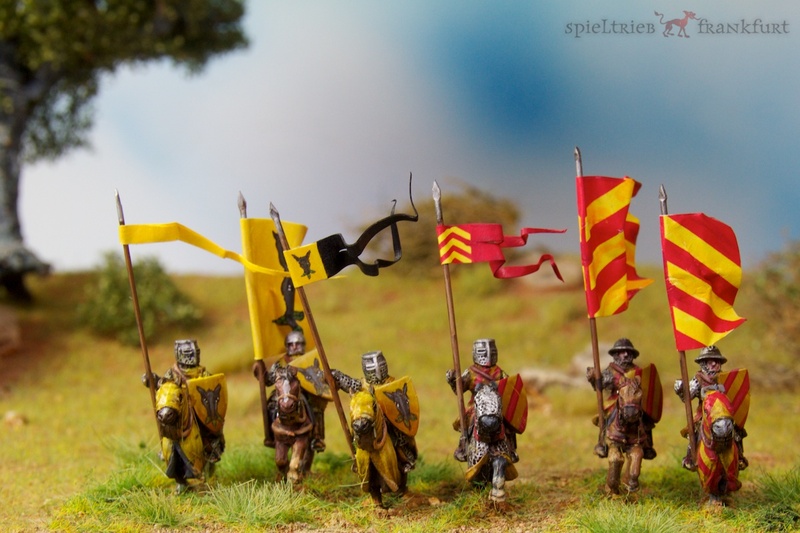 Much inspiration for the whole project came from Antipater´s Konradin army. I am very happy that my gaming club Spieltrieb Frankfurt decided to play Impetus in 15mm on a regular basis in order to have another common gaming system available to most members. 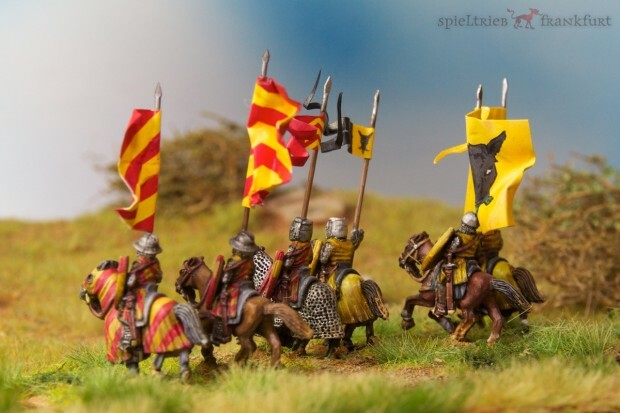 FoW is still our basis, but we wanted to add more variety and since we have had much fun with Impetus in 28mm, we decided to learn more about the game in detail within a club campaign. This usually leads to more skillful players. 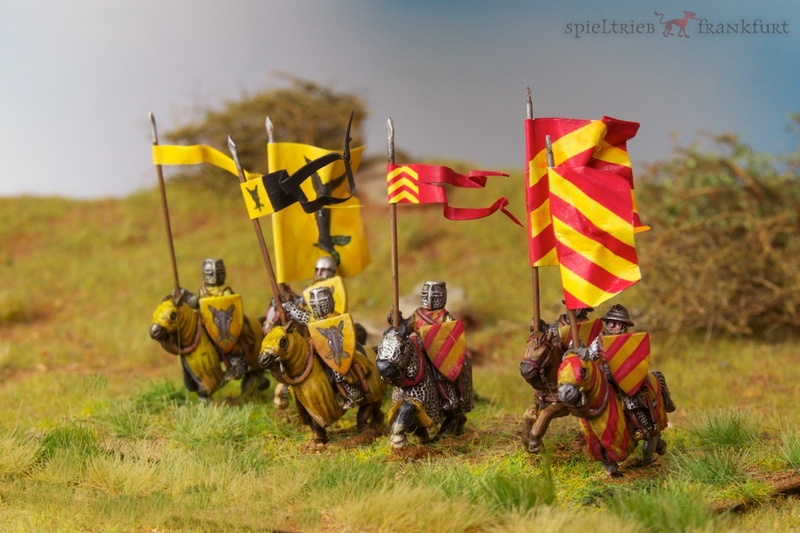 I have chosen an army which represents the forces fighting for the Abbey of Fulda in the 13th century. The town I was born in belonged to the Abbey in Fulda. They tried to get more power and land during that time and hence fought a lot. 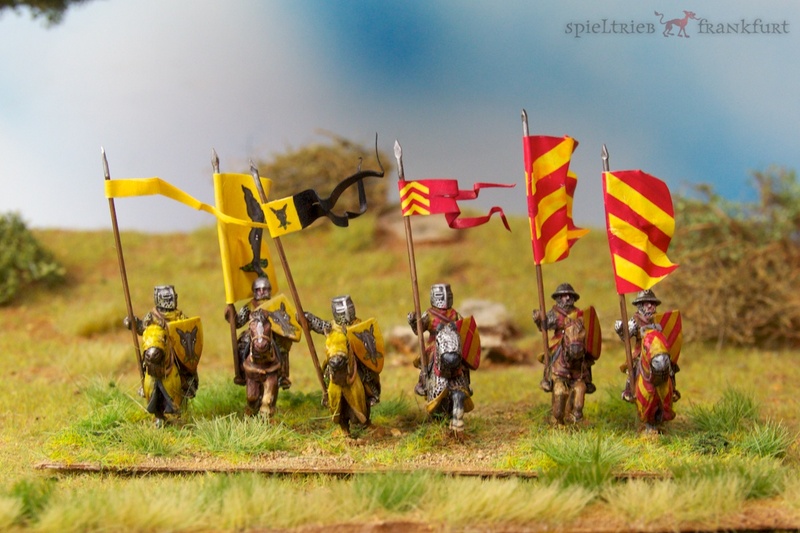 The knighs represent the Knights of Riedesel zu Eisenbach and the Hutten. This family has nothing to do with Jabba, but mabe the name derived from that family. The Hutten took care of the salt mines of the Abbey of Fulda. The idea of having 3 knights or seargants with the same colors was taken from twreuter a club friend of mine who already planned his army including all colors and coat of arms of his troops. I liked his plan a lot and copied the idea. What I like a lot in 28mm to have an entire base themed for a specific troop. They get character during the game and you know automatically what they achieved and where they failed. In 15mm the amount of miniatures is higher but I hope to have a colorful army with many bananers too. So this is the approach and we will see how this works. All lances are again made from plastic broom bristles, the banners are computer printed and painted over. I included 4 rare earth magnets in the flat hand made plastic card base so that I can transport them in a metal box or my magnetic transport cases. Again I am a supporter of very flat 1mm bases, which I sand down at the edges. They are still a little bit flexible which works fine with the Vallojo Acrylic Sand paste I use for basing in addition with some sand. Wow. My first thought was: these are nice 28mm Minis. Then I realized that these were 15mm. Awesome!